Sunderland have taken Chelsea defender Ruben Sammut on trial. The 21-year-old midfielder played the full 90 minutes for the under-23 side in their defeat to Stoke City U23s in the Premier League Cup last night. Sammut came through the ranks at Chelsea, where he has been since the age of eight, and can also play in defence. After making his debut as a scholar in the 2014/15 season, Sammut has played regularly for the Blues' youth teams, progressing from the under-18s to the under-23s. In the summer of 2018, Sammut was loaned out to Falkirk in the Scottish Championship, where he played 15 games. He has also been capped by Scotland's under-21 side. Phil Parkinson has emerged as the bookmakers’ favourite to make a sensational return to Bradford City. The 51-year-old is fondly remembered for his time at Valley Parade after achieving League Two promotion and guiding the Bantams to the Carabao Cup final. He left to join Bolton Wanderers in 2016, competing against City to earn Championship elevation in his debut season before beating the drop last year. Parkinson has been installed as the 9/4 favourite with Gary Bowyer in second. Meanwhile, Martin Drury is set to take temporary charge at Portsmouth this weekend. 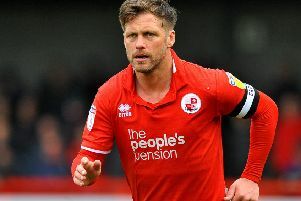 Peterborough United defender Josh Yorweth is facing a four-year ban from football for allegedly dodging an anti-doping test after taking cocaine. The report from the Daily Mail reads: “Testers turned up at the player’s home on a weekday in September. “He had taken cocaine over the previous weekend and falsely believed that a positive test would result in a two-year ban rather than the maximum three months under anti-doping regulations. “Had he taken the test he would also have remained anonymous — even if it had been positive. Owen Oyston has officially been removed from Blackpool's board with receiver Paul Cooper announcing the four people that will take over the day-to-day running of the club. Oyston, along with fellow director Clive Brooks, have both been removed from the board of Blackpool Football Club (Properties) Limited with immediate effect. The 85-year-old, along with daughter Natalie Christopher, has also been removed from the board of Blackpool Football Club Limited. The new board will consist of two former Manchester United directors in Ben Hatton and Michael Bolingbroke while Ian Currie and Tim Fielding also join. Portsmouth manager Kenny Jackett has confirmed Jack Whatmough’s knee operation was a success. The 22-year-old limped off against Doncaster Rovers last month, where scans showed he needed microfracture surgery - used to repair damaged articular cartilage. “It’s been a successful operation, which is good,’ confirmed Jackett. “It’s a well-trodden path for Jack in terms of his rehabilitation but he’s got the character to come through and is a determined lad, a very determined lad. In League Two, Notts County owner Alan Hardy has revealed the club is close to being sold - and the financial problems at his company Paragon will not affect them. He told Sky Sports News: Further to recent speculation about the financial performance of Paragon Interiors Group PLC and any impact this may have on Notts County, I want to assure supporters that the club will not be affected. "In the coming days I expect to receive a formal offer to purchase the club from an overseas consortium and more updates will follow in due course. "In the meantime, I will continue to support the club as best I can while dealing with a very difficult and stressful situation at Paragon." Former Nottingham Forest midfielder Lewis McGugan is on trial at Port Vale, boss John Askey confirmed. McGugan, 30, is a free agent having been released by Northampton last January, and so can join the Valiants ahead of the final part of the season. He trained with the Valiants yesterday and Askey will continue to assess the midfielder this week ahead of a view to a potential deal.